An energy efficient water handling system is a must for any dairy farm. 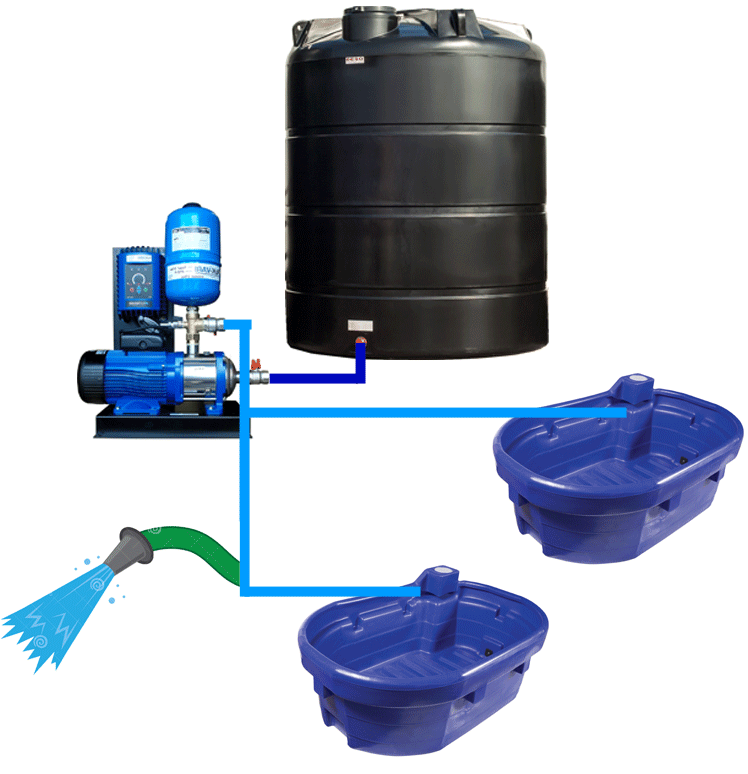 We supply a complete range of fresh and dirty water pumps from mains booster pumps to wash down systems and dirty water extraction. The most energy efficient way to cool your milk is using a suitably sized plate cooler with mains or preferably bore hole water as the cooling medium. It is far more cost effective to remove heat from the milk using water rather than mains electric via you bulk milk tank compressors. WHAT TO DO WITH ALL THAT WATER????? Below we can see one example of an efficient use of the waste water. Don’t forget we’ve already saved money using water as the cooling power rather than electric, but if we can now utilise that “waste” water we can further increase the efficiency of the system. The first step is to have containment, we have opted for a 12,000 ltr container fitted with a safety float to stop the pump running dry, and a further float to top the tank up with fresh water if needed. This way we always have a minimum amount of water in the vessel to feed our system. Step two is to fit a variable speed multi stage pump specifically sized for the system. The pump is matched to system requirements. How many drinking troughs, wash down hoses e.t.c. Variable speed pumps are the ultimate solution, they give us continuous flow at whatever pressure is required by the system. The pumps are able to speed up and slow down to match the delivery requirements. A motor running at 80% of its maximum speed uses 48% less energy! The same pump can now run large volume washers with high demand, and water troughs with very low demand. With the system setup up and all peripherals connected we now have a fully contained system. We are cooling our 5000 litres of milk from 37 degrees down to 18 degrees halving the size of the milk tank compressors. The milk is hitting the tank a lot cooler, further reduction can be obtained with an instant cooling glycol chillers or suitably sized ice bank. We now have 10,000 litres of water to use. This water should be used and more for wash down and supplying the heard with fresh drinking water. If more water is required our system is designed to top the tank up to maintain a steady water level.